Fitness has always been an important aspect of my life, even from a young age. Prior to having all my four babies (having lost a fourth in infancy to meningitis), fitness was always my passion. But after giving birth to all my beautiful babies, along with my love and passion for health and fitness, came inspiration. 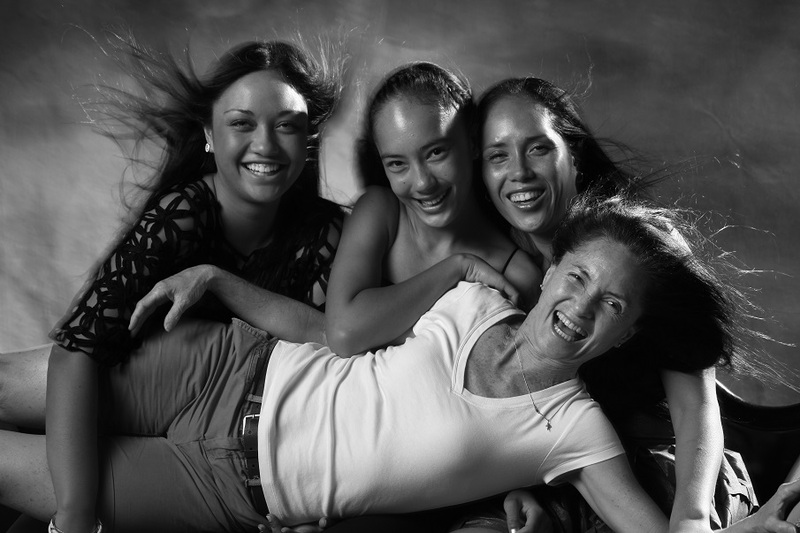 My daughters, Tiana (born in Rarotonga, Cook Islands), Reihana (born in Israel),and Terena (born in New Zealand), have all inspired me from day one to stay fit and healthy so that I can be there for them and be actively involved in all aspects of their lives. My daughters have given me the motivation to maintain a healthy lifestyle. The girls were preteens when they started following me from local gymnasiums to church halls to do aerobics with my students. Back then I carried a big boom box and tapes and they all helped carry equipment in and out of the facilities that I taught my classes. While I taught my classes my girls would either sit and do their homework or participate in the class. I always made exercise a priority even when I was busy working and being a full-time mum. I cooked healthy meals and attended and supported all my girls’ activities. When my girls were teenagers they became members at the local gyms I worked at. Getting fit and healthy was always a part of our lives – it’s a family affair. It was what we did as a family and we have fun doing it! Together we choreograph routines and have been involved in charity fundraising events, attended fitness conventions and certification workshops and I get them to lead one or two numbers during my classes. I believe that good relationships between mothers and daughters are especially important for helping girls grow up with good eating habits, self-esteem, and a positive body image. Being able to workout with your daughter will allow you to connect and strengthen your relationship in a whole new way. We are a team and I am very proud of my girls. I am always teaching them the importance of healthy living. I have shown them that health is not something you take for granted and that they should make exercise a part of their life. I think it’s important to be a role model and to have a positive influence in your kids’ lives. I tell my girls that when you do what you love, success will follow you—and it has. Now things have come around in a full circle – I guess it just happened naturally. My girls help me out whenever they can in an industry that I am passionate about. All three of my girls have all gained their Zumba certifications and are now licensed Zumbainstructors. Tiana and Reihana who are both studying at Auckland University in New Zealand, are both passionate about health and fitness and both are involved in their small little business called “Chicks With Sticks.” My eldest daughter Tiana also takes care of her son Keanu who is a dedicated athlete and very talented rugby player. I had dreams of owning my own studio from a very young age. I wanted to be a successful group fitness instructor. Through my strong will and commitment, I continued to pursue my dream with a determination to be successful at what I loved. Twenty-five years later, I find myself happily working as the owner of my dance and fitness studio called Studio M Dance Fitness. Every day I am grateful that I find passion and purpose in my work. My passion for fitness has enabled me to create a career from something I love. The most important thing that I have learned was that group fitness is not just about exercise, but about creating an experience that brings joy to peoples’ lives. I have helped hundreds of mothers and daughters in my 25 years of working in the fitness industry to get in shape and strengthen their relationships through this powerful program! Previous Post: « Women’s Appreciation Series: Christine Gallagher!